We’d love your help. Let us know what’s wrong with this preview of The Haunting by T. Damon. A new king is crowned in Nymph Kingdom, and shortly afterward a portal to the underworld is opened; releasing ghosts, beasts, and horrifying creatures. Goblins run rampant and kalpies move about at their whim, causing death and destruction in their wake. The Forest has fallen into darkness, and now a full-blown haunting is upon it. Felix, the inexperienced warrior son of fa A new king is crowned in Nymph Kingdom, and shortly afterward a portal to the underworld is opened; releasing ghosts, beasts, and horrifying creatures. Goblins run rampant and kalpies move about at their whim, causing death and destruction in their wake. The Forest has fallen into darkness, and now a full-blown haunting is upon it. Felix, the inexperienced warrior son of famed nymphs Narena and Kellen, must prove his worth as a warrior to his parents and Garmon, the grumpy leader of his army, by ending Rowan's reign and closing the doorway to the underworld. That is, is he doesn't get distracted by beautiful warrior faery Eleonora first. To ask other readers questions about The Haunting, please sign up. T. Damon lives in Northern California, where she spends most of her time imagining new worlds and bringing them to life through her writing. Oddly enough, most of her professional life has been in the zoological field, where she volunteered at the San Francisco Zoo and worked as a tour guide at Safari West in Santa Rosa for many years. She even participated in a study conducted in the Mojave deser T. Damon lives in Northern California, where she spends most of her time imagining new worlds and bringing them to life through her writing. Oddly enough, most of her professional life has been in the zoological field, where she volunteered at the San Francisco Zoo and worked as a tour guide at Safari West in Santa Rosa for many years. She even participated in a study conducted in the Mojave desert that researched the reproductive habits of the threatened California Desert Tortoise. T. Damon always assumed she would make her career in the animal field, as she holds a Bachelor's degree in Zoology, but her passion for writing was a fire within her heart that was not to be ignored. T. Damon also spent some time working with autistic children as a teacher's aide at a special needs school. Additionally, she loves music, especially oldies, an affinity she inherited from her amazingly eccentric, record-collecting father. She was eager to make her own music, and played bass guitar in several rock bands throughout high school and college. 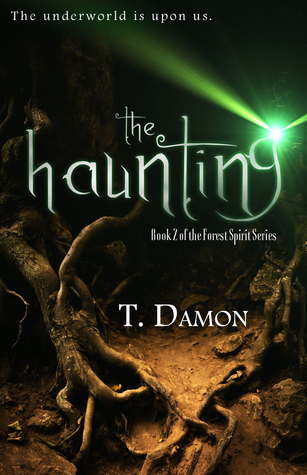 T. Damon enjoys exploring the paranormal, and all things magical, mystical, and mythical. Her interest in horror novels and movies sparked a never ending quest to scare herself silly, and she's still awaiting the book or film that will prevent her from ever sleeping again. Aside from this, she spends a lot of her free time learning about astrology, crystals, and perfecting her methods of various divinations, such as tarot card readings.